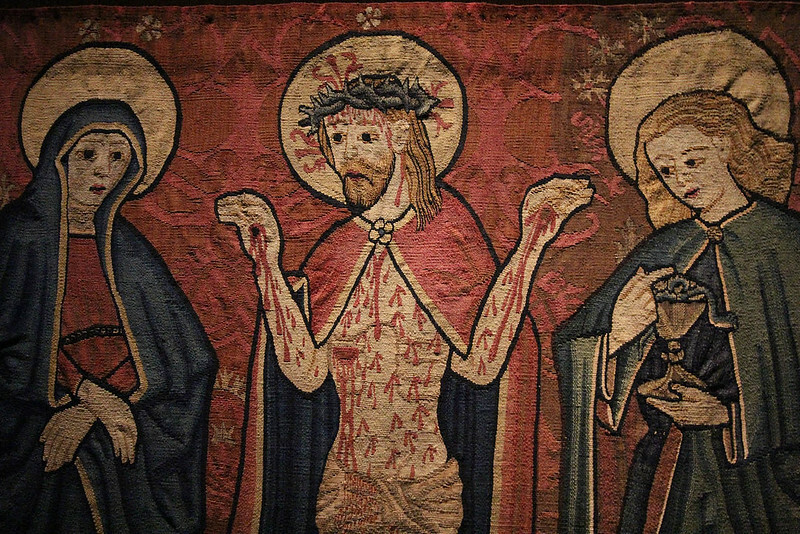 A couple of days ago we spent a lovely (albeit freezing) day seeing the Metropolitan Art Gallery, starting with its smaller and less visited gallery at The Cloisters. 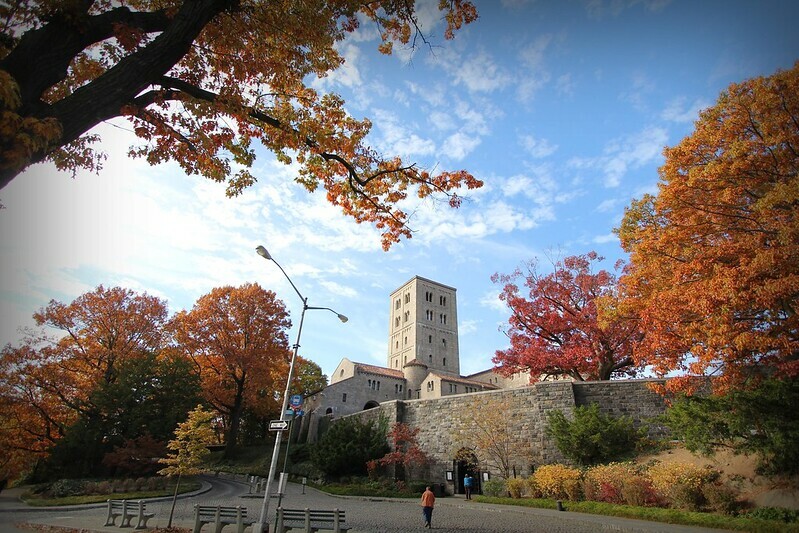 The Met is divided into two properties, the enormous building in Central Park and the much, much smaller Cloisters, located at the northern end of the Manhattan. 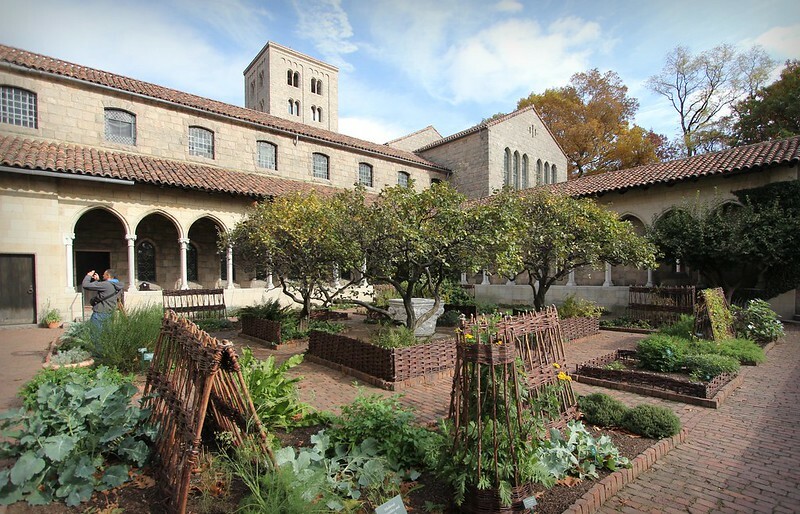 Many of the ‘Top Things to do in New York’ articles I’d read mentioned The Cloisters but didn’t really describe it in much detail. Our friend Sean wanted to go so we agreed to meet there at 10am. It really was a long subway ride north – by the time we got to the right stop pretty much everyone had gotten off except a bunch of old ladies. There’s an elevator specifically for the Cloisters and Tryon Park from the station platform and it goes a surprisingly long way up through the hill. We walked out and into Tryon Park, a truly gorgeous stretch of landscaped gardens that was glowing with colour in the morning sunshine. 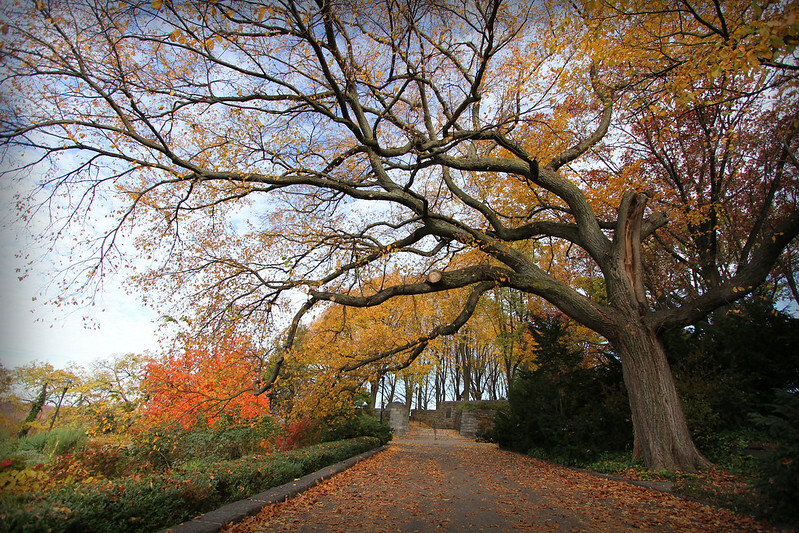 We really picked a good time to see the city – I can’t imagine any other season being so visually impressive. The Cloisters building is relatively new, but is built to resemble a medieval cloisters and contains many elements that are genuinely antique. Old doors, stained glass windows, alter pieces and furniture are built into the structure and compliment the quite impressive collection of medieval art and artefacts. Impressive in terms of quality, not quantity – but I quite liked being able to peruse in detail a small but excellent collection. The effect of the building somewhat spoiled by the bus stop and street lights. 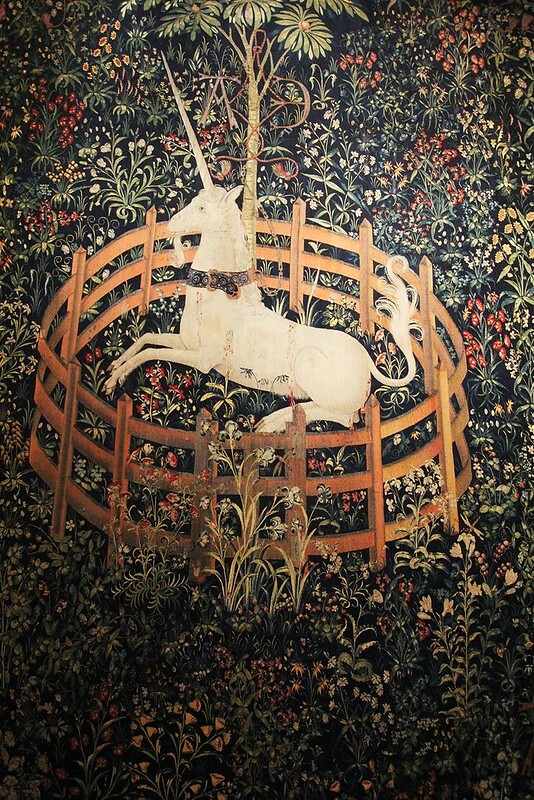 They have some astonishingly well preserved tapestries – in fact you may well recognise this one, which is part of a set that tells the story of a unicorn being hunted and caught. There were some really incredible books that were about 1000 years old, hand written (obviously) by monks and the writing and illuminations are so perfect that it is no wonder their art was preserved for holy subjects almost exclusively. Another charming aspect of the building was the medieval garden, in which grew medicinal plants and edible herbs. It was arranged and tended beautifully. There were quince and fig trees and even the remains of hops vines. My garden dreams of gardens like this. There was a special exhibit there when we visited. The choir from Salisbury Cathedral in the UK had collaborated with an artist to record a special musical piece where the artist had recorded each member of the 40 strong choir individually then each voice was played at the gallery through an individual speaker. 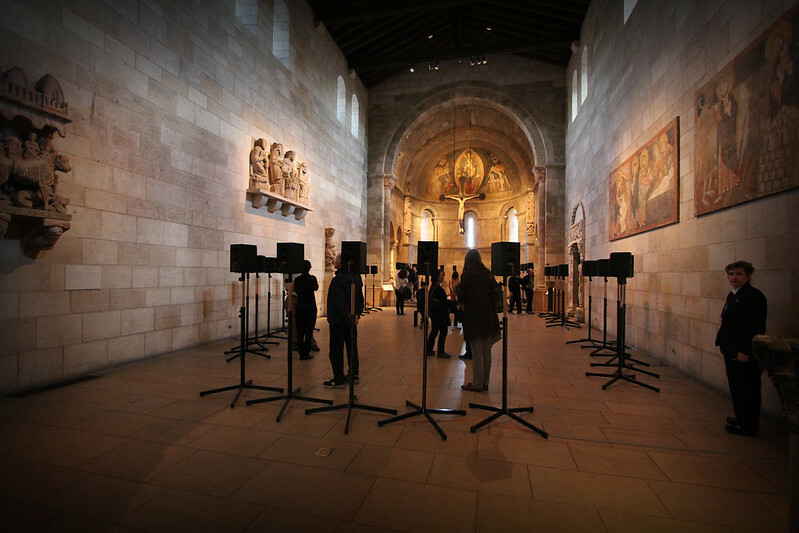 This meant we could walk between the speakers and hear what each voice sounded like and how the rest of the choir sounded to each member. It was amazing. The song was written in the middle ages by one of the most famous composers of the genre (don’t ask me who) and was very complex and extraordinarily uplifting. You could see everyone in the room being overcome by the beauty of the music. The music was so right for the setting. A shame I can’t really convey it in a blog. « New York: Feeling Sick. Aw, thanks! I really do think this is the best time of year to be here, so colourful!